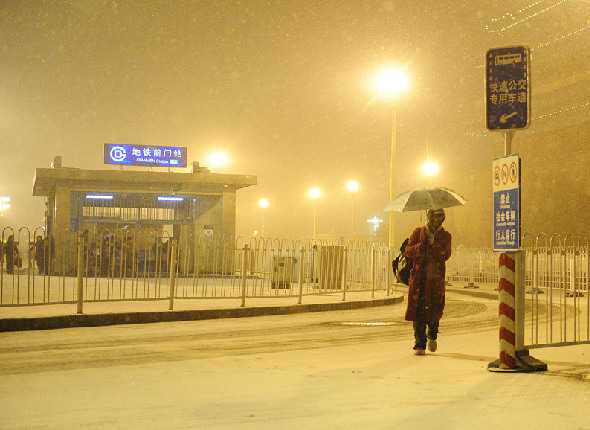 Heavy snow battered parts of northern China on Thursday, prompting authorities to close highways and prepare for flight delays. Sleet is forecast to sweep most parts of Shandong Province from late Thursday to Friday, the local meteorological bureau reported. Temperatures are expected to drop to freezing on road surfaces, raising the possibility of ice forming, the bureau warned. The authorities have ordered partial closures of 12 highways in the province. At least 15 flights were delayed in the airports of the province's two major cities -- Jinan and Qingdao. In neighboring Hebei Province, police sprayed salt and defroster on roads to prevent ice forming. Highways were also closed. In northwest China's Xinjiang Uygur Autonomous Region, snow has accumulated to 40 cm thick in towns and 60 cm in rural areas after unusually large amounts of precipitation fell in the region since early December, said Gao Minghua, head of the meteorological bureau of the Kazak Autonomous Prefecture of Ili. In some rural areas, cattle have had difficulties finding food as snow on the ground is too thick, a grave situation that might bring catastrophe for local herding families, officials added.